Designed specifically for teachers in Northern Virginia schools, this part-time program based in Falls Church helps you earn a Special Education master's degree while working full-time. 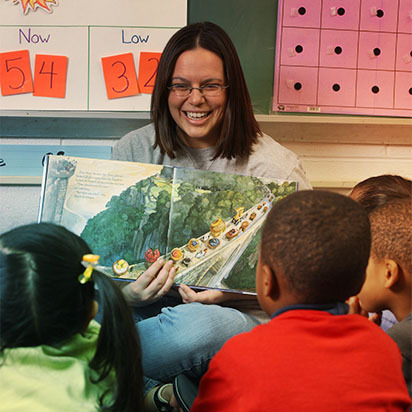 The Curry School of Education and Human Development is proud to offer a Master of Teaching (MT) degree with licensure and endorsement in Special Education-General Curriculum (i.e. mild to moderate disabilities) for those in the Northern Virginia area. We offer a part-time program designed specifically for those who work during the school day and have already completed an undergraduate degree. This is an initial licensure program. Check out our Special Education Northern Virginia Advising Guide for a comprehensive list of program offerings, requirements, and resources. See the Student Handbook for specific program policies and procedures. Review the Curry Clinical Experiences FAQ document for more information about clinical experiences. For more information about teacher licensure and the Curry School, please visit our Licensure page. Students interested in our Charlottesville-based program should visit our Special Education on-grounds program page. 3. Meet the Virginia Department of Education test score requirements. Please refer to the linked chart for more information. 4. Complete the online application for admission and submit supporting materials, including official transcripts and test scores. NOTE: Applicants may upload unofficial transcripts and test scores with applications, but will need to provide official transcripts and official test scores before they can matriculate.